Rivers is one of the thirty-six (36) states in Nigeria. It was carved out from the defunct Eastern region of Nigeria by Decree No. 19 of 1967. 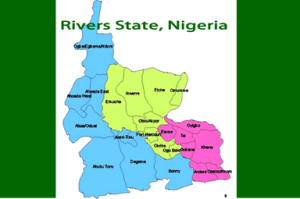 Rivers territory had once been referred as Oil Rivers Protectorate, a named derived from its central role in the oil trades of the last two and half centuries. The state is the bowel of the hydrocarbon industry, that sustains the nation’s economy. Since the creation of Rivers State no fewer than fifteen (15) administrators had administered its affairs. The programmes and policies of each of the administrators had impacted positively on the lives of the Rivers people and others residents of the state. Each of the past governors performed creditably and placed the state on the path of speedy development. Beside the administration of Navy Commander Alfred Diete-Spiff which aggressively brought physical infrastructural development into the state, Chief Senator Melford Okilo’s tenure revolutionized the entire state by pushing Rivers to the front burnrer of national politics. Late Chief Okilo’s administration believes in rural development thereby creating urban centres which unequivocally ignite development in the nooks and crannies of the former Old Rivers State. Chief Okilo’s regime was peaceful. However, with the passage of time, Rivers experienced unprecedented cult wars that devastated the entire state. Ancient communities that made up the state began to war against each other. The state became a theater of war, Rivers communities sitting on the keg of gun powder, exploding now and then. Rivers State became then a war-torn zone. Investors, and businessmen avoided the state because of fear of the unknown. Development became stagnated as the state shrouded with cloud of uncertainties that led to confusion and chaos. The state witnesses a dramatic change as Chief (Barr.) Nyesom Ezenwo Wife stepped into the Brick House in May 29, 2015. Despite the odds against Gov. Wike’s administration from the opposition party – All Progressives Congress, APC, the Governor is succeeding. He has changed the face of Rivers State. Development is gradually spreading like a wild fire in harmattan season to every part of the state.